(Nanowerk News) Nanoparticles, engineered materials about a billionth of a meter in size, are around us every day. Although they are tiny, they can benefit human health, as in some innovative early cancer treatments, but they can also interfere with it through viruses, air pollution, traffic emissions, cosmetics, sunscreen and electronics. A team of researchers at Washington University in St. Louis, led by Lan Yang, PhD, the Das Family Career Development Associate Professor in Electrical & Systems Engineering, and their collaborators at Tsinghua University in China have developed a new sensor that can detect and count nanoparticles, at sizes as small as 10 nanometers, one at a time. The researchers say the sensor could potentially detect much smaller particles, viruses and small molecules. The research appears in the Proceedings of the National Academy of Sciences online Early Edition Sept. 1, 2014 ( "Highly sensitive detection of nanoparticles with a self-referenced and self-heterodyned whispering-gallery Raman microlaser"). The image shows arrays of self-referenced and self-heterodyned Whispering-Gallery Raman microlasers for single nanoparticle detection. 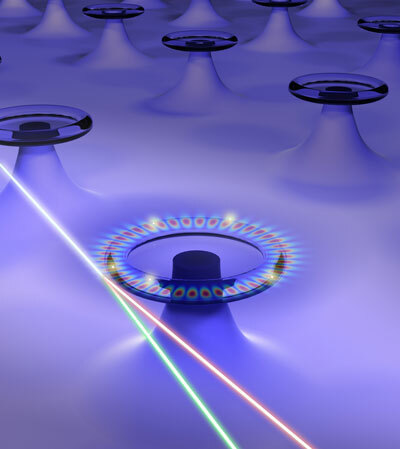 A 'pump' laser generates a single Raman lasing mode inside the silica resonators. Upon landing of a nanoparticle on the resonator, Raman laser circulating inside the resonator undergo mode splitting leading to two new lasing modes in different colors. Monitoring the changes in the color difference (frequency difference) enables detecting and measuring of nanoparticles with single particle resolution. Yang and her colleagues have created the Raman microlaser sensor in a silicon dioxide chip to find individual nanoparticles without the need to “dope” the chip with chemicals called rare-earth ions to provide optical gain for the microlaser. Incorporating additions to the microresonator creates the need for more processing steps and increased costs and invites biocompatibility risks. In addition, the use of rare-earth ions requires specific “pump” lasers matching the energy transitions of the ions to generate optical gain, so for different rare-earth ions, different pump lasers must be used. Using the Raman process loosens the requirement of specific wavelength bands for pump lasers because Raman gain can be obtained using pump at any wavelength band, Yang says. “This gives us the advantage of using the same dopant-free sensor at different sensing environments by tailoring the lasing frequency for the specific environment, for example, at the band where the environment has minimum absorption, and for the properties of the targeted nanoparticles by just changing the wavelength of the pump laser,” says Sahin Kaya Ozdemir, PhD, a research scientist in Yang’s group and the first author of the paper. Yang’s team integrated Raman lasing in a silica microcavity with the mode splitting technique pioneered by her group to develop a new, powerful sensor that more readily detects nanoparticles. The technology will benefit the electronics, acoustics, biomedical, plasmonics, security and metamaterials fields. Yang’s microsensor is in a class called whispering gallery mode resonators (WGMRs) because it works similarly to the renowned whispering gallery in London’s St. Paul’s Cathedral, where a person on one side of the dome can hear a message spoken to the wall by another person on the other side. Yang’s device does much the same thing with light frequencies rather than audible ones. 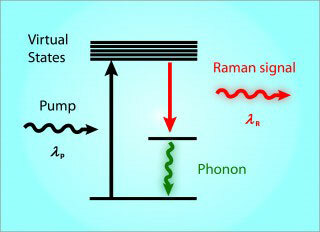 Raman scattering process: A photon with shorter wavelength from a 'pump' laser loses portion of its energy for being scattered by silica molecules and is converted to a 'signal' photon of longer wavelength (labelled as Raman signal) together with a 'phonon'. Sum of the energies of the signal photon and the phonon equals to the energy of the pump photon. Signal photons inside the whispering-gallery-mode resonator are then coherently amplified leading to Raman laser. One of the main differences between early resonators and the novel resonator, known as a morphology dependent resonator, was they didn’t use mirrors to reflect light. Yang’s WGMR is an actual mini-laser that supports “frequency degenerate modes,” patterns of excitation inside the mini-laser’s doughnut-shaped ring that are of the same frequency. One portion of light beamed by the Raman laser goes counterclockwise, another goes clockwise. When a particle lands on the ring and scatters energy between these modes, the single Raman lasing line splits into two lasing lines with different frequencies. When a Raman laser beam is generated in the resonator, it likely will encounter a particle, such as a virus nanoparticle, on the circle. When the beam initially sees the particle, the beam splits into two, generating two lasing lines that serve as reference to the other to form a self-referenced sensing technique. In addition to the demonstration of Raman microlasers for particle sensing, the team says their work shows the possibility of using intrinsic gain mechanisms, such as Raman and parametric gain, instead of optical dyes, rare-earth ions or quantum dots, for loss compensation in optical and plasmonic systems where dissipation hinders progress and limits applications.